Today, the publisher Atlus officially announced a U.S. localization for Legend of Legacy, a video game that, like most video games, probably should’ve been called something else. Balanced for the West - Based on user feedback following the Japanese release, several gameplay adjustments were made to enhance the gameplay. More details to come later! Huh! Atlus wouldn’t elaborate, but that’s promising. I’ve got an appointment to see the game at E3 next week, so I’ll keep you guys updated on this (and all the other JRPGs at E3) then. 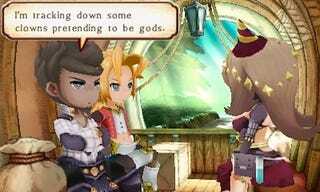 Legend of Legacy will be out in the fall.